It's 00:13 in Jefferson City, USA right now. 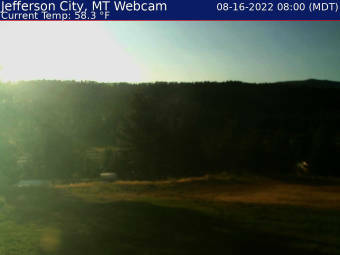 Weathercam Jefferson City MT Webcam and weather. Bozeman, Montana: Baxter Meadows, 67.6 miles away. Ennis, Montana: Ennis Lake, 73.4 miles away. Big Sky, Montana: Big Sky Resort, 82.6 miles away. Livingston, Montana: Lone Tree Ranch, 86.6 miles away. Hamilton, Montana: City View, 102.2 miles away. Gibbonsville, Idaho: Lost Trail Pass - US-93, M.P. 351, 107.7 miles away. Lolo Hot Springs, Montana: Lolo Pass US-12, M.P. 174.2, 121.7 miles away. Henrys Lake, Idaho: US-20, M.P. 401, 122.9 miles away.